Remember the excitement of lining up in the street as a child to see a parade? Well, we took care of bringing this joy into your garden with the rose Parade Day. The swirl of bright white and fuchsia pink novel coloration brings to mind the movements of the floats. And don't worry - the show will not be over soon as the flower color holds until the petals drops. 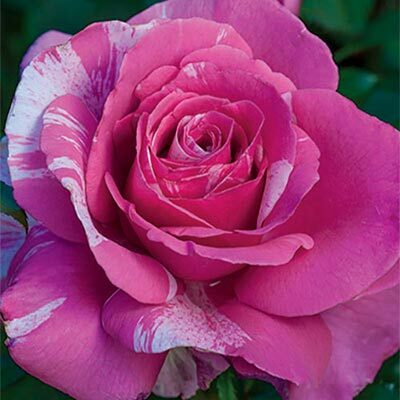 Just as fond childhood memories include both sights and smells, Parade Day blooms profusely with elegant buds and flowers accompanied by a very pleasant strong citrus-like fragrance with hints of spices. The petals of each bud are perfectly organized like a well-synchronized marching band. The rhythm created is enhanced with attractive large foliage on a well-covered vigorous plant. Now, let's bring family and friends into the garden to enjoy the performance!